Sometimes it is fun to read a teenager in the 1960's story of meeting one of the Beatles. I like them because they were written at the time and not written many years later when the fan grew into an adult and remembered the meeting. The stories always have such different details (such as what socks Paul was wearing) and are so dramatic! This is an encounter a lucky teenager had in 1964 in San Francisco. Paul was very kind to allow them into the room with the reporter as I think the reporter was annoying and the girls scared him some. This was from the Summer 1965 issue of Datebook magazine. Is this a shot of Paul seeing Sue holding up her autograph in the audience? The mention of the word Paul brings back beautiful memories. Memories of a day I met him face to face, touched him, talked with him. I was in such a trance I could hardly talk, but just stared into those big beautiful brown eyes. But, I guess I’d better start at the beginning. San Francisco was the first stop of the Beatles 30 day tour. They arrived at the airport on the evening of Tuesday, August 18. Since it was against my parents’ wishes, I did not greet them upon their arrival. My friends and I were very excited about getting to see them because it had been four months since we purchased the tickets to their performance. At about 11a.m. Jean, Joby, Chris and I arrived at the Hilton Hotel where the Beatles had just spent the night. We went up and down the elevators and exit stairs. We could go anywhere except the 15th floor. Guess who was staying there?! Our attempts to rush the guards all failed. 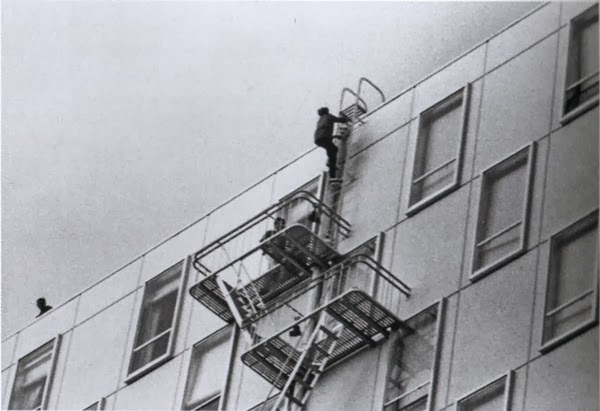 We thought of climbing the fire escape or renting maids’ costumes, but we knew this wouldn’t work. We were going along the side of the hotel opposite from where the big crowds were, when we saw a few girls screaming. WE looked up to the window to see a Beatle sitting with his back against it. When he turned around and waved, we knew it was Ringo! Then, we started talking to a woman who was having her lunch break and it turned out she was a reporter on a San Francisco newspaper. She told us how she met Elvis, Kookie, Connie Francis and others. She had a note from the promoter authorizing her to interview the Beatles. We begged her to take us with her and soon we were on the 15th floor, handing the note to the guard who looked suspicious since he had seen us before. Eh read it and then handed it to a woman who was a security guard, who in turn read it. She told us to wait there and she proceeded down the hall. I thought “Are the Beatles really in there?” I was sure it would prove to be a manager or the police or almost anybody else. After a minute, the door opened and out popped a head that could never be mistaken – the head of Paul McCartney! I had never failed in my life, but at that moment I felt from close t doing it. He just said, “Girls? Girls, come on in girls!” I was in such a state of shock I could hardly believe he was real. As we walked through the doorway, I noticed that the room was very small. I saw an open suitcase on the floor and the room seemed a bit messy. Obviously, they had just gotten up. The bed covers were all crumpled and the leftovers of their breakfast were on the table. Paul went behind the table as we came in on the other side. He then leaned over and said hello and shook hands with each of us. When he took my hand in his firm grasp, I felt a charge shoot through me. I was on the verge of crying and his big brown eyes seemed to be laughing at me. I opened my mouth to say “Hi” but it came out more like a croak. Paul then asked us to sit down so we sat on the bed and he took a chair. Paul’s wavy brown hair was hanging straight over his forehead, not bushed to the side. He was wearing a lavender shirt and tight black and white tweed pants. He looked even more slender than I had thought he was. I saw that he had on black socks and black leather shoes, with buckles on the top. 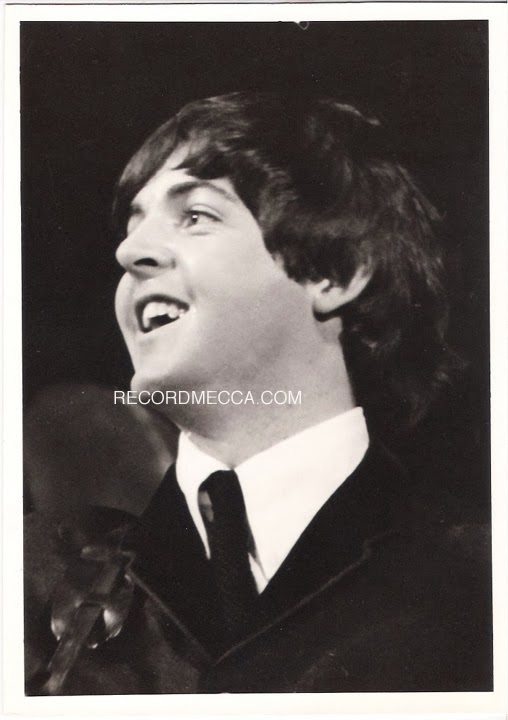 Our reporter friend told Paul that she thought that the Beatles records were improving. He said, “thanks” but looked a bit hurt. We all laughed and said we thought their records had always been the best. The reporter then said something about how she used to be in some Elvis fan club. I groaned. Paul’s twinkling eyes shot towards me and he laughed. I was in such a trance that I just couldn’t talk although there were millions of things I wished I could ask hm. “Would you like to see my jumping beans?” said Paul, trying to start a conversation. “They’re Mexican jumping beans!” He seemed excited as though he had never seen any before. So we said, “Sure!” But when he looked on top fo the table and didn’t seem them, he exclaimed, “Oh my goodness, they’re not here. They must have jumped all over the place!” Someone then pointed them out in a plastic box and he remembered, “Oh yeah, I put them in the box” and he picked it up. The reporter said, “Do you know what is in them…worms!” As Paul turned and dropped the box, he twisted up his face and said “ick.” He looked so cute! As we talked, we learned that the Beatles would not get to see any of San Francisco because they couldn’t get away, although John and Ringo had slipped out in the middle of the night. Paul explained that their manager planned all their schedules and it would be nicer if they could have more free time in some places. Joby asked where the other Beatles were and Paul replied that Ringo and John were in the service showers. He didn’t mention George so I don’t know whether he was clean or not! Once Jean got up to look out the window (under which a pair of famous Beatle boots were sitting) and I followed. Just as I caught a glimpse of the tops of the fans’ heads, Paul yelled, “don’t go near the windows! Get away, get away!” As we came away he said more calmly, “You know how those fans are. They’ll go crazy if they see anyone.” I don’t know whether he was tired of the screaming or whether he was worried for our safety, because if they had seen us we might have been torn apart when we left. As it was, nobody believed that we had seen him. We also learned that they would be making a new movie in February and that Paul’s home in Liverpool was in Allerton, although it came out more like Alison through his thick accent. Paul didn’t seem to excited when the reporter told him that he looked like her two year old daughter. Chris then asked Paul how long their Cow Palace performance was going to be. When he replied, “About half and hour,” we all sighed disappointment. I begged him, “Please, please do more!” Paul replied sympathetically, “Oh a half hour’s a lot of singing. Besides we’re too lazy.” I don’t think they’re really lazy but their shows must take a lot out of them. The reporter said, “As long as we’re here, we should get some autographs.” Paul said okay, so we all dug in our purses to find something suitable to write on. The night before, I’d put John Lennon’s book in my purse what we all thought to be a silly idea that I might get close enough for him to sign it. He didn’t sign it but Paul did and that’s just as unbelievable. It says on the first page: “To Sue, love Paul McCartney.” The ink smeared in one spot and there is his fingerprint where he touched it. The reporter asked him for autographs for all her friends and Paul said, “Aw come on, luv!” He said he had to hurry because they were due for a radio interview. I think he was lying but I guess he was tired of us. Then he took my hand in his and squeezed it as he said goodbye. He winked to all of us as we left. We were shoved into freight elevator and taken downstairs. As soon as I got outside, I started screaming. I think I was a bit hysterical. I kept looked up at the window and crying. “We were just in there with Paul!” When we reached the side of the hotel where the crowds were, we told them that we had met Paul, but nobody believed us even when we showed them the autographs. At the performance that night I saw in the first section. I wanted Paul to recognize me so I took out John’s book and opened it to where he’d signed it and waved it back and forth and screamed his name. I’m sure he saw me because he kept looking my way and smiling. The Beatles last song was “Long Tall Sally” and when they left, all was quiet. There were no more screams and my ears were buzzing. Some of the girls were crying, but I hope that nobody felt as sad as I did. After all nobody else in San Francisco had met Paul so it wouldn't have seemed as much of a personal loss to them. I'm just glancing through this since I'm at work, will read it when I get home.....but I just love these stories, and I never cease to be amazed at how you keep finding these amazing nuggets!! !